So what can be said about these Titanium GeForce cards from MSI? Obviously the numbers speak for themselves. MSI has done a very good job overall of bringing out the best of nVidia's Titanium Lineup. I say overall, because there area few quirks that irked me, such as the absence of thermal compound for the GeForce3 based cards, I just can't believe MSI overlooked that, especially since their G2Ti Pro-VT has thermal compound between its GPU and heatsink fan. Also, I think the temperature monitoring needs more work. It's good that they have a thermistor on the PCB, but it could be in a better position, closer to the the GPU for instance. In the case of the G3Ti500 Pro-VTG, it wasn't even touching the heatsink! It was just hanging there getting ambient air temps! Still, there was plenty to be impressed with for almost every card. It was great to see TV In and Out as part of every video card. Even though the Phillips 7108E chipset isn't the best, it does a fine job at outputing DVD's to a television. 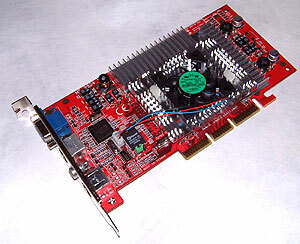 For the GeForce3 based cards, the G3Ti200 Pro-VTG and G3Ti500 Pro-VTG it's a nice touch to have 3D glasses. Sure, I probably won't use them on every single game I have, but obviously there's a market for them. Just look at how successful the Asus Deluxe line of cards are! On top of everything, MSI has got a lot going for it in terms of price. With their cards costing as much as 10% less then the competition, and being packed with so many features, there really isn't any reason someone shouldn't consider MSI when contemplating getting their first Titanium videocard.